The Korean Empire’s last princess Deokhye was the youngest daughter of Emperor Gojong and his concubine. She was born when Gojong was over 60 years old, and he loved his baby daughter dearly. But she lived a tragic life, having been forcefully taken to Japan and kept there for years. 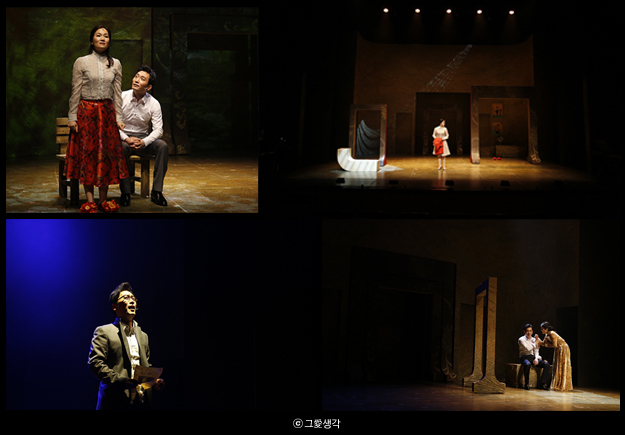 Her sad life has been adapted into a musical, which is being presented at Seongsu Art Hall. It was not surprising that Princess Deokhye was Emperor Gojong’s favorite, because she was his youngest daughter. It was common during colonial eras that an occupied country’s royal family member or nobles were taken to the occupier country and married off to the locals. Unfortunately, Princess Deokhye was chosen as the royal hostage. She was taken against her will to Japan at age 13 under the pretense of continuing her studies. Then her mother passed away while the princess was still in Japan. Although she was in deep shock over her mother’s death, the Japanese government forced her to marry a son of the Tsushima Island lord. She then gave birth to her daughter Jeonghye,정혜 who is an important character in the musical. Although Princess Deokhye was the Korean Empire’s last princess, she died in 1989, which made her our contemporary. Her sad life was brought to public attention only when her story was published as a novel in 2009. When Princess Deokhye was born in 1912, nobody could have predicted that such a hard life awaited her. King Gojong had turned 60 when the princess was born. He loved her dearly, not only because she was the baby of the family, but also because she took after him the most. So ecstatic over the princess’s birth, the king immediately granted the royal title of Boknyeongdang복녕당 to Concubine Yang, the princess’s birth mother, and threw a lavish party. According to the royal records, no Joseon king had ever hosted such a big celebration in honor of a newborn princess. King Gojong even went against the court rules and let the baby princess sleep in his sleeping quarters and opened a kindergarten in Deoksugung Palace so that he could visit her every day. But the princess’s happiness soon came to an end when King Gojong passed away in 1919, and her hardship began. Seongsu Art Hall is hosting a photo exhibition of the Korean Empire era. Among the 30 photos on display, there are some pictures taken right before the princess was taken to Japan. Her expressions in those photos were grim as if she could have sensed the sad fate waiting for her. 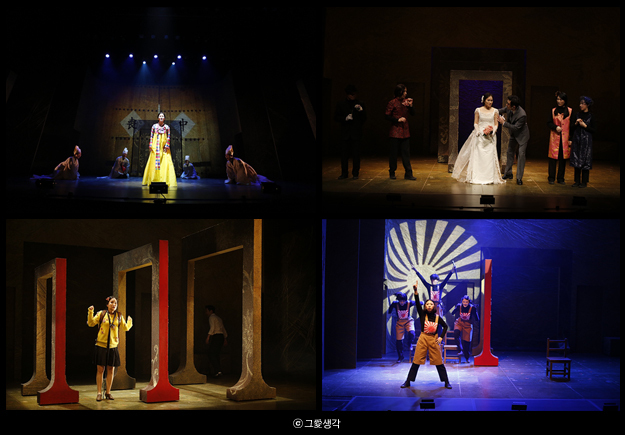 Here’s Ms. Kwon Mi-yeon권미연, a member of the musical production team, to tell us more about the photos. This was taken in the rear garden of Changdeokgung palace, together with her friends and a teacher. Now this one was taken the day before she was taken to Japan, during a performance. Everyone’s dancing in the field, in a circle. Here she is seen at a farewell party, and behind her is a picture she drew. She looks really sad, maybe because she is about to leave. This picture was taken on the departure day with guests and other employees. The guests are all wearing kimonos, while two of them are in hanbok. She took this picture with her homeroom teacher and principal. Her lips are tightly closed but her eyes are sad. She was so pretty. This was taken before she left school. One of the photos was taken at Seoul Station, called Gyeongseong경성 Station back then, right before she left for Japan. Her trip was supposedly for her studies, but actually she was taken as a hostage. Here’s Ms. Kwon Mi-yeon again. This was Gyeongseong Station. The photo on the left was taken at the station and the one on the right up at the veranda. You can see that she was wearing a kimono in both pictures, which appeared to foreshadow what kind of fate waited for her from then on. The pictures seemed to say that although she was a Korean princess, she might have to live like the Japanese. These pictures are sad because they seem to foretell her gloomy future. Although Princess Deokhye was of Korean blood, the only pictures showing her in hanbok are those taken when she was a baby. She was dressed in western-style clothing or in kimono in most other photos, indicating that even a princess did not have the freedom to dress in her country’s own traditional outfit when her nation’s sovereignty was taken away. People seeing the princess in the black-and-white pictures can’t help but feel the same despair she must have felt so many decades ago. (Woman 1) I’m from Anyang and I’m looking at a picture of the princess in kimono taken at Gyeongseong Station. She has a baby face, but she doesn’t look innocent and happy in any of the photos. It looks like she’s suppressing her feelings. (Woman 2) I’m from Gwangjin-gu in Seoul. This photo is of Princess Deokhye and her classmates. It saddens me that their faces are expressionless and they look dispirited. People at that young age should look cheerful. That’s what makes me sad. These pictures seem to reflect the overall mood of that time. The princess’s bleak feelings are expressed in a score titled “Let’s Laugh, Laugh.” Here’s actress Moon Hye-young문혜영 who played Princess Deokhye in the musical production. There is a score called “Let’s Laugh, Laugh” in the musical. The lyrics go, “I must look confident. I must not appear like I was dragged here. Let’s laugh, laugh.” I think this part is the saddest, because I, as Princess Deokhye, have to sing this part with a smile on my face, but the princess must have been dying inside. Which part of her turbulent 77 years on this earth did the production team place the most focus on? Here’s the musical’s director Seong Cheon-mo to answer that question. It’s a historical fact that Princess Deokhye was the poor, last princess of the Korean Empire, which used to be the Joseon Dynasty. What interested me was the fact that her daughter went missing when she was 23. Her marriage was an unwanted one and she went through a hard childbirth, but she still loved her daughter. What happened to her family, to her marriage, and to her afterwards? That’s the focus of this production. Through this musical, I wanted to show that a tragic historical event does not end in one generation, but continues to the next. The musical covers a stretch of time between 1925, when Princess Deokhye was forced to go to Japan, and 1962, when she returned to Korea. The plot revolves around the princess, her husband Takeyuki, and her daughter Jeonghye. In the story the princess’s husband is portrayed as a husband and father, who tries his best to hold his family together. Here’s Director Seong Cheon-mo to explain why the Japanese husband was portrayed so sympathetically. We had no way of knowing what kind of person Takeyuki actually was, but we know that he was also a pawn ordered into an arranged marriage. He was adopted twice in his childhood by his childless relatives to carry the family name, which showed that his life was shaped not by his own volition, but by others. Even his marriage was an arranged one. Although we don’t know his true character, we assumed that he could have been just another victim of Japan’s imperial ambitions. Count Takeyuki is ordered by the Japanese Emperor to marry Princess Deokhye. In the musical there is a scene where Takeyuki comforts and respects the princess whenever she felt depressed in the earlier years of their marriage. He could have acted this way, if he had regarded both of them as the casualties of imperialism. Princess Deokhye’s marriage was never a happy one, but she still became pregnant with a baby. She had been suffering a nervous breakdown ever since her forced relocation to Japan. But her pregnancy appeared to calm her nerves and she reportedly took great prenatal cares to keep the baby healthy. Here’s the musical’s director, Seong Cheon-mo, to tell us more. A baby would have made all the difference for the princess, even if her marriage was not a perfect one. I believe that’s why she took great care of herself and the baby during her pregnancy. I think those nine months could have been the happiest time in Japan for the princess. The baby symbolized hope for both the princess and her husband. Their baby Jeonghye was a confirmation that Takeyuki now had a family of his own and something to live for. That’s why I think that was the best time for the couple. But their happiness is short-lived. After the birth of her daughter, the princess’s fragile mental state deteriorates to post-partum depression and finally to schizophrenia. To make matters worse, Takeyuki becomes penniless when the American military regime seizes the assets of Japanese aristocrats after Japan’s surrender in 1945. He puts the princess in a mental hospital and starts a divorce proceeding. Princess Deokhye was separated from her only child and abandoned by her husband. She was locked in the psych ward for more than 10 years. Her symptoms were indications of early onset Alzheimer’s. But when Jeonghye went missing, Takeyuki regretted his decision to admit Deokhye into the mental hospital. Takeyuki supposedly kept searching for his daughter until his death. Historical accounts say that Jeonghye disappeared in 1956. Only rumors abound in her disappearance. Some say she was killed, some say she committed suicide, and some say that she just decided to vanish, but we have no way of knowing. In the musical production Princess Deokhye and her husband are portrayed as desperately lonely people, steeped in regret but craving love. Director Seong Cheon-mo tells us more about these two characters. I tried to show that the two characters came to comfort each other, rather than reconcile. They came to terms with their tragic lives and the daughter’s disappearance, and found a way to comfort themselves. I want those who’ve seen the musical to realize how great family love is and develop deeper trust and love for their loved ones. Love for her family was what kept her alive and fighting her loneliness. Princess Deokhye’s story inspires today’s Koreans to appreciate their families and people around them. Princess Deokhye returned to Seoul in 1962, 38 years after she was taken to Japan. But by then she was wasted both in mind and body. Until her death in 1989, she spent her life longing for her father, King Gojong, in the Sugangjae building in Changdeokgung Palace. Her last message reads, “I miss my father. My biggest sin is to have been born as the last royal blood of the Korean Empire.” Hopefully, this short message makes all of us realize how fortunate we are to be with the ones we love.